For most bands, starting out with your longest song can flirt with disaster and lose interest quick. But for dynamic rock and roll juggernaut Wilco, they’re talented and confident enough to pull off such a feat. The song – “One Sunday Morning (Song for Jane Smiley’s Boyfriend)” off their recent album “The Whole Love” – stretches an impressive 12 minutes or so and fleshes out an autobiography type story brilliantly sung by the band’s frontman Jeff Tweedy. Of course, anyone who knows the band’s history and their two day stint at the Pabst Theater a few years ago knows this kind of risk-taking thrives with this band. Tweedy, dressed in a suit and wearing a brown brimmed hat, is certainly a big reason for that. For the most part, Tweedy comes from the Bob Dylan/Neil Young school of how to be a songwriter; one who can weave words together beautifully and sometimes subtly. Since Wilco formed in the break-up of country-tinged Uncle Tupelo, the band has gone many routes in their history with rock, country, folk and anything-goes experimentalism. Certainly that’s a good way for a band to endure the years and keep fresh. The band came out amongst an interesting background of cloths hanging from the rafters; one that came alive with images being shot on it or individual ones lighting up (at one point looking like bells on Christmas). 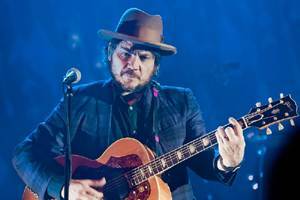 As expected, the band played a heavy dose of their new album “The Whole Love,” an album that sheds light on the many sonic territories Wilco has traveled. From the catchy fuzzed out rocker “I Might” to the quieter “Red Lung” (Tweedy joked and thanked that the PBR/Schlitz buying crowd was quiet during the song), the band brought one of the year’s best albums to life on stage. That certainly applied to their song “Art of Almost,” a song that sweeps along fairly casually before knocking you off your feet with intense jamming. The song is the first track on the album and finds Wilco experimenting a bit. Guitarist Nels Cline gets a lot of love from the Wilco faithful but even they can appreciate when he’s fully let loose as during that song. Pure emotion dripped through his raging guitar stampede, as he and the band jammed to epic finish. Another moment that Cline shone through was during “Impossible Germany” from their album “Sky Blue Sky,” where he powered through a beautiful and brilliant finger picking guitar jam. The rest of the night’s set found the band jumping freely between the rest of their albums, from 1995’s “A.M.” to 2009’s “Wilco (The Album).” Highlights included brilliant versions of “Poor Places,” “Misunderstood,” “War on War,” and “I Can’t Stand It.” The dynamic “Poor Places” ended in some trademark Wilco reverb. The crowd sung along to many of the songs including “Misunderstood” and was on cloud nine for most of the show. During “I Am Trying to Break Your Heart,” Tweedy’s twist on a breakup song, the singer walked to the front of the stage and led the crowd through a triumph chorus of the song. Songs stormed along or in the case of “Outta Mind (Outta Sight)” strolled along leisurely. One of the hidden gems of the night came with the country-infused “California Stars” off their album collaboration with Billy Bragg. Tweedy and the band were in high spirits during the whole show and it certainly showed. At one point Tweedy half jokingly and half seriously told a fan that their loud clapping was one of the loudest things he’s heard - to which someone from the crowd offered a pair of mittens. Also during the fairly rare live cut “I Can’t Stand It” Tweedy launched into a passionate rock and roll shriek/howl as he, the band and the crowd lapped up the energetic atmosphere up like Eggnog on Christmas morning. The band saved some room for desserts during their eight-song encore. They fired into a series of songs including “Outta Mind (Outta Sight)” “The Whole Love,” Someday Soon,” Box of Letters,” “Heavy Metal Drummer,” the Rolling Stone-ish “Monday” and “Outtasite (Outta Mind)”. But even that couldn’t top what was to come next when opener and rock and roll legend Nick Lowe came out to join the band. With his commanding voice billowing through the theater, Lowe and Wilco exerted life into his 1979 classic “Cruel to Be Kind.” It was a perfect meeting of forces, ala Bob Dylan and The Band. Lowe might be 62 but his vocal prowess couldn’t be more intact; in fact he’s only gotten better. While he performed his set solo with an acoustic guitar for his set, Wilco allowed him to roll back the sleeves and have fun. While Tweedy joked about it, perhaps a collaboration between the two (WilcLowe anyone?) isn’t such a wild idea. Certainly there are openers and then there’s Nick Lowe. The show was Lowe’s second time in the city after a long break from the states and he sure looked excited to be there. Lowe, the self proclaimed “Jesus of Cool,” took complete command of the stage with a set highlighting the many albums from his long career. He’s somewhere in the class of a Johnny Cash/Roy Orbison/Tom Waits kind of singer – there’s simply a special kind of aura, atmosphere and history that he brings and that can’t be ignored. His lyrics brought wisdom (without getting too serious, he said he’d stay away from some of his deep folk material), wit and humor, among other things, and many in the crowd were left entranced by his set. He featured a number of songs of this year’s “The Old Magic,” including “Stoplight Roses,” proof he’s still doing quite well at his profession. Other highlights from his set included “Lately I’ve Let Things Slide” (off 2001’s The Convincer), “Long Limbed Girl” (off 2007 At My Age), and “I Live on a Battlefield” (off 1994’s The Impossible Bird), and “I Knew the Bride When She Use to Rock and Roll” (off 1985’s The Rose of England). Lowe also played the song “Alison,” one he originally penned for Elvis Costello’s album “Aim is True.” Lowe stopped at one point to reminisce about his past visits to the city with “When I Write the Book,” a song he wrote with Dave Edmunds and Rockipile in the late ‘70s. That night the rock and roll spirit was fully kicking.